For other uses, see Blood and Blood (disambiguation). The Bloods comprise various sub-groups known as "sets" between which significant differences exist such as colors, clothing, operations, and political ideas which may be in open conflict with each other. Since their creation, the Bloods gangs have branched throughout the United States. By 1978, there were 15 Bloods sets. Crips still outnumbered Bloods 3 to 1. In order to assert their power, the Bloods became increasingly violent. During the 1980s, Bloods began distributing crack cocaine in Los Angeles. Blood membership soon rose dramatically as did the number of states in which they were present. These increases were primarily driven by profits from crack cocaine distribution. The huge profits allowed members to relocate in other cities and states. "Bloods" is a universal term used to refer to West-Coast Bloods and United Blood Nation (UBN). While these groups are traditionally distinct entities both refer to themselves as "Bloods". The profits of crack distribution allowed the Bloods to spread in other states. UBN started in 1993 in Rikers Island's George Motchan Detention Center (GMDC) to form protection from Latin Kings and Ñetas who were targeting the African-American gang members. UBN is a loose confederation of predominantly African-American street gangs. Once they were released from prison, the UBN leaders went back to their neighborhoods in New York where they retained the Bloods name and started recruiting members. UBN has between 7,000 and 15,000 members in the Eastern USA region. The gang makes its income through various criminal activities like distribution of crack cocaine, smuggling of drugs into prison, etc. and its gang members are involved in various criminal activities. Bloods refers to a loosely structured association of smaller street gangs, known as "sets", which has adopted a common gang culture. Each set has its own leader and generally operates independently from the others. Most Bloods members are African American males, although some sets have recruited female members as well as members from other races and ethnic backgrounds. Members range in age from early teens to mid-20s; however, some hold leadership positions into their late twenties and occasionally thirties. There is no known national leader of the Bloods but individual Bloods sets have a hierarchical leadership structure with identifiable levels of membership. These levels of membership indicate status within a gang. A leader, typically an older member with a more extensive criminal background, runs each set. A set leader is not elected but rather asserts himself by developing and managing the gang's criminal enterprises through his reputation for violence and ruthlessness and through his personal charisma. The majority of set members are called "soldiers", who are typically between the ages of 16 and 22. Soldiers have a strong sense of commitment to their set and are extremely dangerous because of their willingness to use violence both to obtain the respect of gang members and to respond to any person who "disrespects" the set. "Associates" are not full members, but they identify with the gang and take part in various criminal activities. To the extent that women belong to the gang, they are usually associate members and tend to be used by their male counterparts to carry weapons, hold drugs, or prostitute themselves to make money for their set. Recruitment is often influenced by a recruit's environment. Bloods recruit heavily among school-age youth in predominantly poor African American communities. Gang membership offers youth a sense of belonging and protection. It also offers immediate gratification to economically disadvantaged youth who desire the trappings of gang life: gold jewelry, cash, expensive sports clothing. Bloods sets have a loose structure of ranks based on how long a person has been involved with a particular set. The ranks do not signify leadership or dominance over the set; they merely signify respect for those who have been in the set longer and have survived the longest. Those with a higher rank do not have a position of authority over Bloods of a lower rank. Bloods members commonly refer to themselves as CKs (an initialism of Crip-Killer), MOBs (an initialism of Member of Bloods), dawgs, or ballers (meaning drug dealers). Gangs including Bloods have been documented in the U.S. military, found in both U.S. and overseas bases. Bloods members identify themselves through various gang indicators such as colors, clothing, symbols, tattoos, jewelry, graffiti, language, and hand signs. The Bloods gang color is red. They like to wear sports clothing, including team jackets that show their gang color. Some of their favorite teams include the San Francisco 49ers, the Philadelphia Phillies, and the Chicago Bulls. They are also known to wear Dallas Cowboys clothing, whose logo contains a five-pointed star. The most commonly used Bloods symbols include the number "5", the five-pointed star, and the five-pointed crown. These symbols are meant to show the Bloods' affiliation with the People Nation, a large coalition of affiliates created to protect alliance members within the federal and state prison systems. These symbols may be seen in the tattoos, jewelry, and clothing that gang members wear as well as in gang graffiti, which is used by the Bloods to mark their territory. Such graffiti can include gang names, nicknames, declaration of loyalty, threats against rival gangs, or a description of criminal acts in which the gang has been involved. Bloods graffiti might also include the word "Piru" which refers to the fact that the first known Bloods gang was formed by individuals from Piru Street in Compton, California. Bloods graffiti might include rival gang symbols (particularly those of the Crips) that are drawn upside down. This is meant as an insult to the rival group and its symbols. Bloods members also have a unique slang. Bloods greet each other using the word "Blood" and often avoid using words with the letter "C". 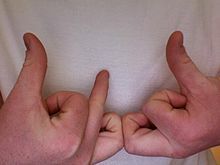 Bloods use hand signs to communicate with one another. Hand signs may be a singular movement, like the American Sign Language letter "B", or a series of movements using one or both hands for more complex phrases. United Blood Nation (UBN) or East Coast Bloods initiates often receive a dog paw mark, represented by three dots often burned with a cigarette, on their right shoulder. Other UBN symbols include a bulldog and a bull. Chapters of the Bloods are called "sets". ^ Netgraphe inc. (2006-09-30). "Canoe – Infos – Dossiers Les gangs de rue se partagent Montréal". Fr.canoe.ca. Retrieved 2013-06-05. ^ "2011 National gang threat assment". FBI. 8 November 2011. Retrieved 19 February 2019. ^ "NCGIA Gang Profiles: Bloods". Archived from the original on 17 December 2014. Retrieved 14 January 2015. ^ a b c "Bloods". Gangs In Maryland. University of Maryland. Archived from the original on 2008-12-06. Retrieved 2009-02-21. ^ "Juggalos: Emerging Gang Trends and Criminal Activity Intelligence Report" (PDF). Public Intelligence. Retrieved 2013-06-05. ^ a b Harris, Donnie (2004). Gangland. Goose Creek, South Carolina: Holy Fire Publishing. p. 49. ISBN 978-0976111245. Retrieved January 14, 2015. ^ Alonso, Alex (2010). "Out of the Void". In Hunt, Darrell; Ramos, Ana-Cristina (eds.). Black Los Angeles: American Dreams and Racial Realities. New York City: NYU Press. p. 153. Retrieved January 14, 2015. ^ Hyman, Michael D. (2013). "Appendix II: Gangs Highlighted by the National Drug Intelligence Center". Drugs in Society: Causes, Concepts and Control. Abingdon, England: Routledge. p. 473. ISBN 978-0124071674. Retrieved 14 January 2015. ^ Barrett, Robin (2011). The Mammoth Book of Hard Bastards. Boston, Massachusetts: Little, Brown Book Group. ISBN 978-1849017596. Retrieved January 14, 2015. ^ Maxson, Cheryl L. (October 1998). "Gang Members on the Move" (PDF). Juvenile Justice Bulletin. Washington DC: U.S. Department of Justice. ^ Sullivan, CJ (November 5, 2002). "Blood In, Blood Out: Bronx Gang Members Explain Their Creed". New York Press. New York City: Manhattan Media. Retrieved January 12, 2019. ^ Covey, Herbert C. (2015). "Crips and Bloods Snapshots: Examples of Crip and Blood Gangs". Crips and Bloods: A Guide to an American Subculture. Santa Barbara, California: ABC-CLIO. p. 163. ISBN 978-0313399305. ^ Riviello, Ralph (2009). Manual of Forensic Emergency Medicine: A Guide for Clinicians. Burlington, Massachusetts: Jones & Bartlett Learning. p. 191. ISBN 0-7637-4462-X. ^ "Gangs Increasing in Military, FBI Says". Military.com. McClatchy-Tribune Information Services. Archived from the original on November 13, 2009. Retrieved February 21, 2009. Kriegel, Mark (October 13, 1997). "Gangstas launch blood feud crew's superior warns wanna-bes". NY Daily News. Retrieved 14 January 2015. East Orange police raid apartment building as part of crackdown on Bloods set, authorities say. Nj.com. Accessed April 4, 2015. East Orange crime crackdown leads to nearly 60 arrests. Nj.com. Accessed April 4, 2015.